The True Death has a black base with red-to-green shifting shimmer and a scattering of larger gold flecks. 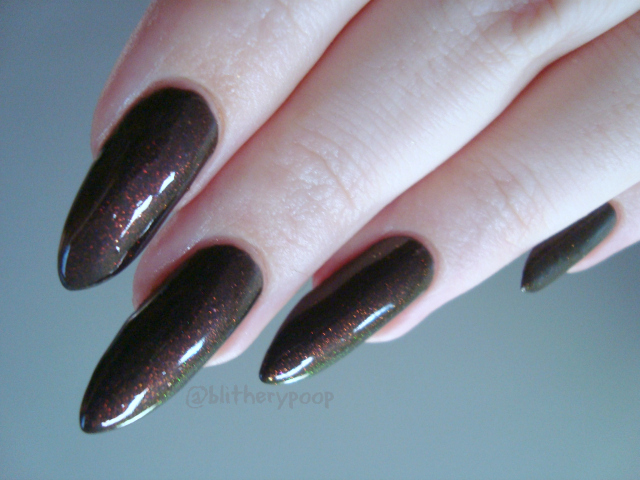 You could put just about any kind of shimmer in a black base and I'd be all over it, but red-to-green is irresistible! 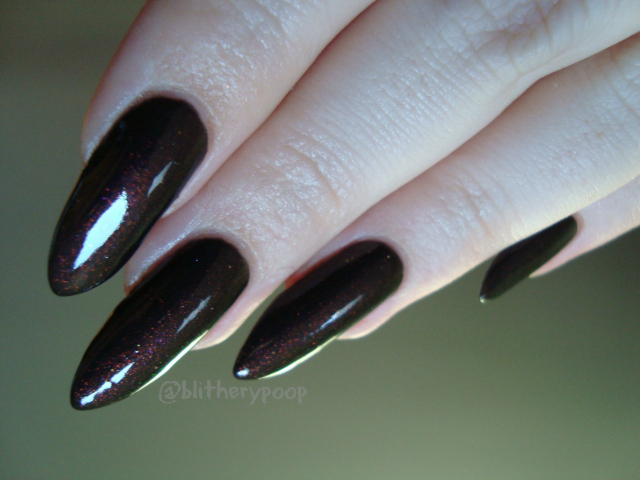 The base is a bit too opaque for the larger flecks to really show up on the nail, but I can't fault the shift! The green only really POPS at extreme angles, but it lingers on the borders at other times. It's subtle, yet not and that's delightful! The only issue with buying second-hand polish is that you can't be sure how the formula was when it was brand new. This collection came out in '12, so for all I know that's when the original owner purchased this bottle. That would explain why it's so thick. It wasn't unworkable, but it took more effort than it should have and the second coat was challenging. It was almost a one-coater, but I needed a second for evenness and VNL protection. I thinned it afterward. I've gotta say, I love how changeable it is! At its deepest, it almost looks purple. So cool! 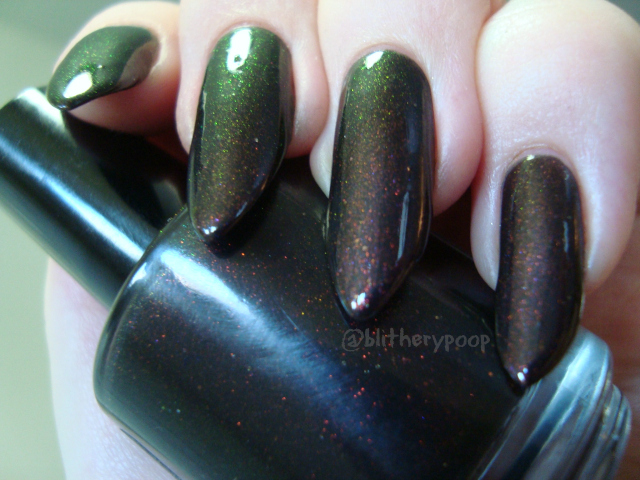 I got KleanColor Chunky Holo Black in a swap back at the start of my polish frenzy. 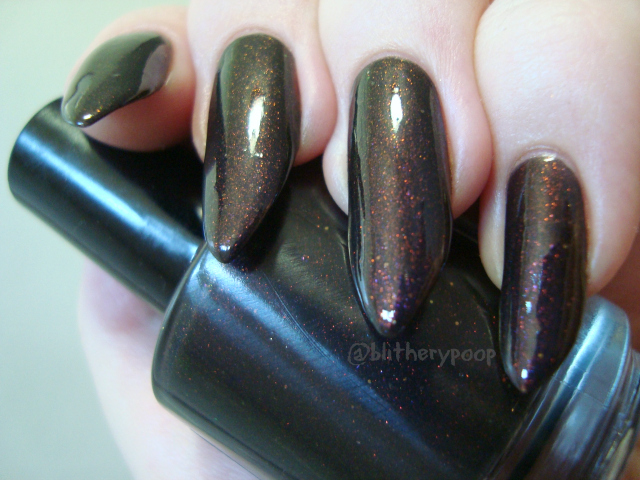 The shift is the same as SOTT/Hidden Treasure/etc, but in hexagonal glitter instead of flakies. The "trouble" is that it's in a brownish tinted base. It limits the layering potential, but I love it over The True Death! The shimmer is just visible enough and it almost looks like it's all the same polish. Quick little reminder...less than two days left to enter week one of Wicked Winnings Wednesday! That Cruella palette could be yours! The True Death is definitely my favourite.